Anyone who have received a Notice of Default and want to know how to stop it should consult with foreclosure lawyer. Los Angeles, September 18, 2015 — Notice of Default is issued when home owners are in default under a deed of trust. Unless they take action to protect their property, the property may be sold at a public sale. Receiving this notice is a very frustrating and stressful event in any homeowner’s life. Figuring out how to stop foreclosure or choosing the best way to stop a foreclosure sale is a very important decision to make. This is when an experienced foreclosure attorney comes into play. Consumer Action Law Group is a seasoned team of foreclosure lawyers who diligently fight on their clients’ behalf to stop foreclosure sales. The foreclosure attorneys at Consumer Action Law Group offer the best options available for their clients to save their homes from foreclosure. Sometimes homeowners are subjected to wrongful foreclosure and a good foreclosure attorney will file a lawsuit to stop foreclosure. The Foreclosure lawyers at Consumer Action Law Group can stop an auction whenever a foreclosure issue emerges. Their experienced lawyers have help many homeowners to stop foreclosure within minutes of calling. Once a homeowner receives the notice of trustee sale and notice of default time is of the essence, and it is very important to call an attorney that can help immediately. The foreclosure attorneys at Consumer Action Law Group help their clients to save their homes and their valuable assets, and also help their clients to eliminate debt. When it comes to stopping foreclosure, it is important to have experienced lawyers fighting to stop foreclosure and save the home. With a good mortgage foreclosure attorney and a legal team on the homeowner’s side, the lender cannot run amok. Consumer Action Law Group is dedicated to helping homeowners facing foreclosure. The experienced foreclosure attorneys of Consumer Action Law Group have filed hundreds of foreclosure cases and saved hundreds of homes by filing lawsuits against lenders and filing bankruptcies. The legal team at Consumer Action Law Group will stop the foreclosure immediately. 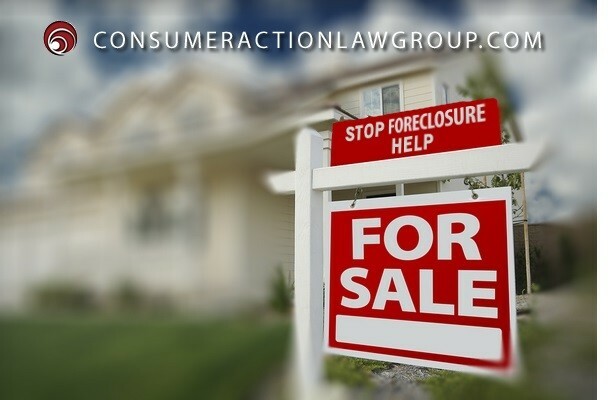 Call Consumer Action Law Group today and talk to a foreclosure lawyer for free at (818) 254-8413!